Spend at least 8 hours a day in the sewing studio (ha...ha...). I will certainly settle for at least 4. Meet all my deadlines for the second book to be published. Now that is one I will keep for sure! Get the patterns out of my head, and onto the sewing table for photos and instructions. Have the most darling business card holder! Grand kids call it my magic box. MOST important one is to spend as much time, or more with family and friends. Especially those darling grand children! Try to spend too much on sewing (another ha...ha.....). Just can't resist those notions. Add more items to the site (ok, checked off on the ordering part, now to get listed when arrive). Learn more sewing techniques, and add some more crochet! So relaxing in the evening. 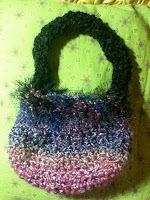 Check out the cute little purse I finished designing. Can't decide to keep or sell. I am certainly a lover of purses (and hats!). Think I have thought of resolutions that I can actually KEEP and have tons of fun trying! Whatever you come up, keep them fun!